Gurney Services at America West Medical Transportation, Inc. have been designed to promote maximum safety and comfort for patients who are bed-bound. Patients can be transported from point to point without having to get up – they can be lying down all throughout the trip. Gurney transportation makes it less stressful for the patient when getting on and off the vehicle too. 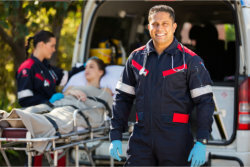 We make sure to provide enough crew members to operate our specially fitted vans thereby accommodating the unique needs of the patient on the stretcher as well as his or her companion for the medical appointment. Please call us ahead to arrange for pick-up and drop-off schedules with Gurney services and other non-emergency medical transportation in Sacramento CA or San Jose CA. Give us a call or contact us for reservations.